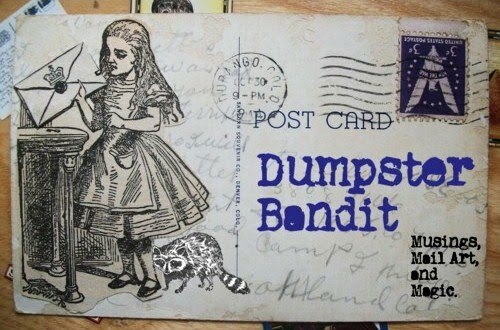 Dumpster Bandit: My Inbox of Old- or last week anyway. Though today was amazing in the Mail area of life, The last several days preceding it had been rather dry. Thus I almost forgot to post these pictures, they were the only rays of light that emitted from my post box all of last week! Front and Back of a lovely piece of mail art sent to me by Taradactyl of SendSomething. I love that she used a multitude of stamps! Totally rad Handmade patch sent to me by Half Pint of SendSomething. And, check out that bike chain stationery! I just got back from a mini road trip and yr letter was waiting for me in the mailbox! thank you times 100 :] it was wonderful.